The way people use their time, their lifestyles, who they are have changed. If we stay in one place, we will become outdated. It is our intention to release some application on smart devices this year that is capable of attracting consumer attention and communicating the value of our entertainment offerings, so I would encourage you to see how our approach yields results. Apparently, the moment of truth is here (or at least, part of it), as Nintendo is starting to chart the free-to-play waters with Steel Diver: Sub Wars and Rusty’s Real Deal Baseball. Both of them are exclusive for the 3DS eShop. Steel Diver: Sub Wars is a submarine-based first-person shooter. Its free version offers a couple of submarines, some singleplayers and the multiplayer mode. Paying $10 unlocks the rest of the game. In other words, the Steel Diver: Sub Wars’ free-to-play approach looks a lot like a demo. Rusty’s Real Deal Baseball, in turn, is a collection of baseball-related minigames, and is scheduled for April (it was originally released in August for the Japanese market). The game comes with some free minigames, but additional ones must be unlocked by paying $4 for each of them. However, here the free-to-play approach comes with a tweak: the players can bribe the shop owner (Rusty) to get a real discount on each minigame. 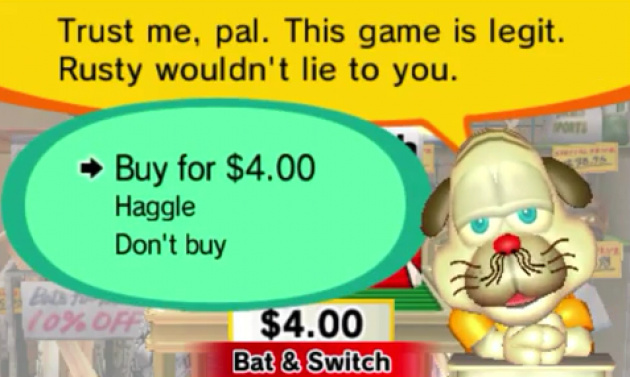 (…) Players can purchase additional mini-games in a unique way: by haggling to lower the real-world price for each downloadable game. Additional games start at $4 apiece, but giving Rusty items or listening to his problems might improve his mood and motivate him to offer steep discounts. In the year in which Sony and Microsoft have a lot of guaranteed press coverage because of their new consoles, Nintendo is doing a remarkable effort to stay relevant. Fortunately for us, so far every announcement seems to be part of a bigger strategy. We’ll see how this attempt at free-to-play works for Nintendo. The good news is that, putting the monetization experiment aside, both games look fun. These have been really busy days for Nintendo. After forecasting a surprise $240 million loss for the current fiscal year, and among different kind of rumors, Nintendo president Satoru Iwata spoke yesterday at an investors meeting in Tokyo and dropped some unexpected news. Since I can’t speak or read Japanese (and since the official Nintendo translation doesn’t include everything), I’ve spent some time researching different outlets and in order to bring you a proper summary. As part of Nintendo’s new strategy, Iwata is reducing his salary in half. Other seven executives (including Shigeru Miyamoto) will get pay cuts between 20% and 30%. The salary reduction starts in February and will last until June, when the situation will be reviewed based on the company’s progress. This move may be unusual for the rest of the industry but not for Nintendo: over 2 years ago, Iwata had made a similar decision following disappointing 3DS sales. Those also were rough times for the company, making its former president Hiroshi Yamauchi lose $500 million in one day. In the long run, the handheld business proved to be healthy for Nintendo. The Wii U, however, seems to be more problematic, having to compete against its classic opponents (Sony, Microsoft) and the emergence of mobile gaming. Therefore, we would like to, instead of directly expanding our business on smart devices, focus on achieving greater ties with our consumers on smart devices and expanding our platform business. (…) Accordingly, I have not given any restrictions to the development team, even not ruling out the possibility of making games or using our game characters. 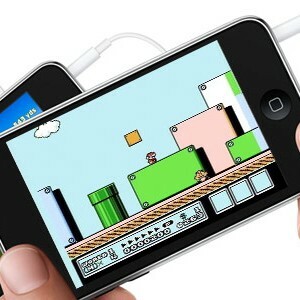 However, if you report that we will release Mario on smart devices, it would be a completely misleading statement. It is our intention to release some application on smart devices this year that is capable of attracting consumer attention and communicating the value of our entertainment offerings, so I would encourage you to see how our approach yields results. Iwata’s next 10 years in the company will focus on “quality of life through entertainment”. 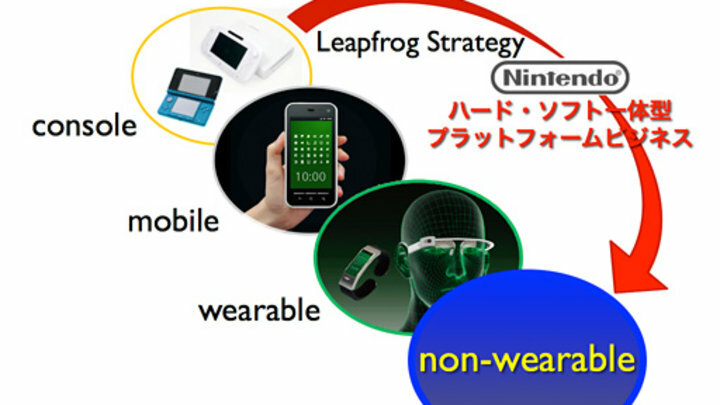 In that line, Nintendo’s next platform will be a non-wearable device to monitor the user’s health, and will be launched during the fiscal year ending March 2016. You can read the official translation of the presentation here. It’s full of interesting quotes. Nintendo president Satoru Iwata gave a press conference yesterday in Osaka (Japan) to admit they need a new business model. What provoked that change was the forecast of a surprise 25 billion-yen ($240 million) annual loss, instead of the original projected profit of 55 billion yen ($538 million) for the year ending March. That $778 million difference between the old and new forecasts forced Nintendo’s management to reflect on their missteps a little. The key element for Nintendo’s new strategy seems to revolve around mobile gaming outside its stellar 3DS console. In other words, the expansion of smartphones. Historically, they have rejected the idea of releasing mobile versions of their properties (Mario, Zelda, Pokémon and Donkey Kong, just to name a few). Mario runs alone. Touch the screen to jump. It’s not as simple as enabling Mario to move on a smartphone. GameMaker Standard edition for free!